0.99% Financing Available, All-Wheel Drive, Heated Seats, Keyless Entry, Rear View Camera, Bluetooth Wireless Technology, Dual Airbags, Daytime Running Lights, Cup Holder, Auxiliary 12V Outlet, Map Lights, Power Steering, Reclining Seats, Inside Hood Release, Tachometer, Tilt Adjustable Steering Wheel, Trip Odometer, Analog Gauges. Door Map Pockets, Digital Clock and Bucket Seats! Plus, a 5 Year/100,000 km Warranty and much more! Come in for a test drive, you will love it! With this 2019 KIA Sportage LX AWD you get all this plus much more! Kids are off to Hockey or Football and you need some extra space for the equipment? No problem, this Sportage has the extra space you need so the kids can get to their game and win! Located just west of Casablanca, 15 minutes from everywhere! 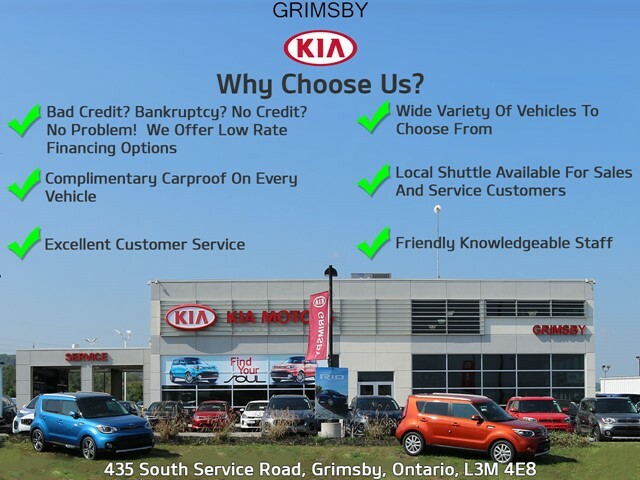 We are unlike any dealership youve ever been to when you come on down to Grimsby KIA you will receive the best customer service experience youve ever had! Our friendly, energetic, knowledgeable staff will take care of you and make sure you get the right product or service that is right for you! With over 150 vehicles to choose from, we have a wide variety of new and pre-owned inventory! All makes and models KIA, Hyundai, Ford, Honda, Toyota, BMW, Mercedes-Benz, Acura, Chrysler, Dodge, GMC, Chevrolet and much more! We are fully transparent and will provide you with a complimentary Carfax on every vehicle! Need to get your vehicle serviced and dont have a ride home? No problem, with our local shuttle well take you home! Good credit? Bad credit? No credit? No problem we can help! So, come on down and see why Grimsby KIA experience is unlike any other dealership you've ever been to!